I really liked Laurel during the first season, and still find her a fascinating character. I know that there are constant wars between some Laurel fans and Felicity fans, but I think that there are more similarities than differences in the two. When we first meet Laurel, she’s buried herself in her work, her determination to help others leading her to take on the corrupt regardless of the financial complications. She’s clearly very intelligent, seeing as she has managed to become a lawyer. She has a defensive streak, protecting herself by maintaining a distance from others, due to something painful in her past. She is working for a pro bono lawyer firm, when she could potentially be earning a good deal of money. Felicity’s introduced a couple of episodes later, but she has also buried herself in her work. She’s doing something below her intelligence and ability level, just like Laurel. She clearly doesn’t like being underestimated, letting loose when Walter calls her into his office, her outrage mirrored by Laurel when Laurel defeats Max’s thugs who are beating Oliver and Tommy. Admittedly it’s not exactly the best start for their friendship when the two first meet on screen it’s a blink and you miss it moment. Laurel meets Felicity. Felicity interrupts a conversation between Oliver and Laurel, and I don’t think the two meet again until season two. It is not until season three when Laurel has been given the story line of becoming the Black Canary, that the two of them start developing a real friendship. I think it’s because Sara, the one that Laurel has the strongest connection with, amongst the female characters, is killed off during the season three premiere. Both Felicity and Laurel spent a good deal of time with Sara, and Sara was the only female friend that we had seen Felicity have on screen, certainly during the second season. 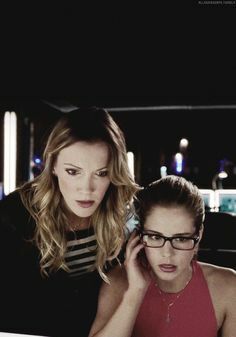 The writers needed to develop the friendship between Laurel and Felicity, especially given the fact that the two characters would be spending a lot of time together, as Laurel became a solid part of Team Arrow. The friendship is cemented during the fourth season, and Laurel is a sounding board for both Oliver and Felicity about their romantic issues, after the exposure of Oliver’s son, and Felicity’s shooting by Damian Dhark. I enjoyed seeing Felicity and Laurel interact, as their relationship was different to the relationships between Nyssa and Laurel, as well as the one between Sara and Felicity. Those seemed to be more about Nyssa and Sara training the other girls, but Laurel and Felicity together alone supported each other in a different way.